Filled with both traditional favorites as well as contemporary fare, authentic Mexican dishes are now accessible to home cooks everywhere. 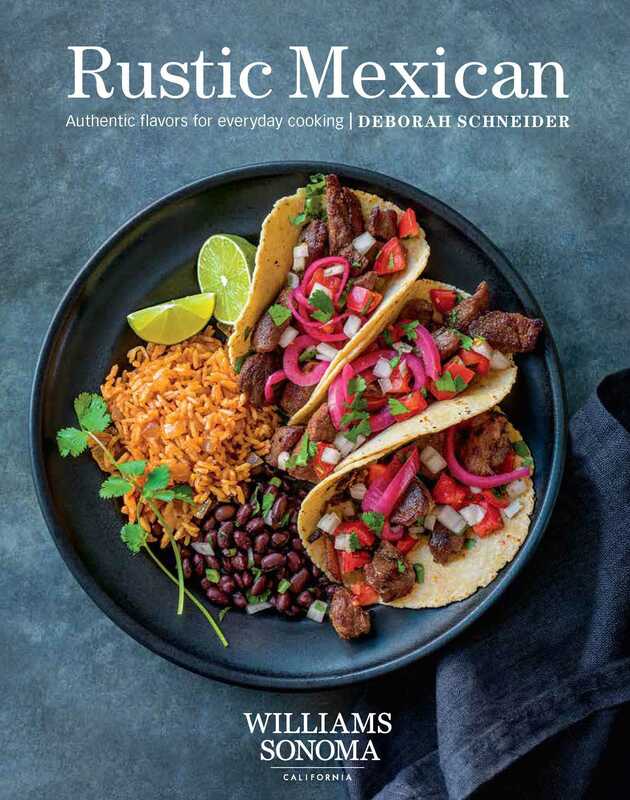 With 100+ delicious, easy-to-follow recipes, a pantry primer and more, Rustic Mexican is the perfect roadmap to help you discover the diverse cuisine of Mexico. Full-color photography, illustrations, and ingredient guides accompany recipes throughout, making Rustic Mexican a comprehensive roadmap to discovering all the great flavors that Mexico has to offer. To prepare the squash, preheat the oven to 375°F (190°C). In a bowl, mix the cubed squash, onion, oil, 2 teaspoons salt, 1 teaspoon black pepper, the cumin, paprika, ancho chile, and brown sugar until well coated. Spread in a single layer on a rimmed baking sheet and roast until soft and well caramelized, 25–30 minutes. Heat a heavy griddle and lightly grease the surface. Cook the tortillas, topped with a pinch of the cheese, until the cheese is melted and the tortilla is slightly crisp. Top each with about ¼ cup of roasted squash, a spoonful of the salsa, and a slice of avocado. Serve with the bottled hot sauce and onion mixture (if using) for diners to fix their own. Char the bell pepper on all sides directly in a gas flame, or under a broiler, until the skin is blackened and blistered. Peel, seed, and tear into smaller pieces. Line a small heavy sauté pan (cast iron is ideal) with a piece of foil and heat over high heat. Roast the tomatoes and one garlic clove until soft and blackened in spots, and set aside with the bell pepper. In a medium frying pan, heat the oil over medium heat. Cook the onion until it begins to brown and caramelize. Add the tomatoes and peppers, cumin, and paprika and cook until the pan is dry. Add 1⁄2 cup (125 ml) water and ½ teaspoon salt and simmer on low heat until the onions are tender. Place in a food processor along with the remaining raw garlic clove and pulse until fairly smooth. Stir in the cilantro, taste, and adjust the seasoning.